Some friends are visiting Inverness and asked if they should check out the monstered waters around that way. Any actual natural beauty bestowed upon the area of Loch Ness has been completely obscured by the legend and mystery of an underwater beast and the few small towns that make a living off it. Since the 1930s there have been numerous reported sightings and scammings of what looked like a swimming brontosaurus, leading the loch to be dubbed a Scottish Jurassic Park. Despite key photographs revealed as fakes and a 1990s Ted Danson schlockbuster, people never stop trying to spot their very own monster of the deep. And thanks to the plethora of tourist shops Nessie sightings are a certainty. You can spot the monster on mugs, t-shirts and pencil sharpeners, not to mention stuffed fluffy toy versions embroidered with slogans like 'Cheeky-Ness' (lizard with its tongue sticking out) and 'Drunken-Ness' (same reptile with crossed eyes). As I browsed Drumnadrochit's high street tourist shops, I was holding out for 'Crap-ness'. Drumnadrochit is definitely the epicentre of 'Tacky-Ness' with two mini-villages of tourist shops duelling for the passing pound. Each village has its own rival short film about the monster - opt for the one that doesn't come with a tour of the concrete-looking Braveheart castle. The Loch Ness 2000 Show runs for about 40 minutes and as it was conducted in the dark I imagined I'd be able to comfortably get in a half-hour nap - partly to make up for the interrupted youth hostel sleep I had last night. But I got pulled into Loch Ness 2000. You wander through a series of atmospherically dark caves, each one tracing an era of sightings and fakes. It was all quite spooky and believable until I leant back on a fibreglass wall. Further southwest, Fort Augustus has its own share of 'Mad-Ness', but there's another reason to stop here. Boats sailing up the River Oich are faced with the Caledonian Canal, a series of locks that they climb like a ladder to access Loch Ness. Massive yachts are led by pilots on rope so they look a little like marine Labradors slowly being walked on a sunny day. Sure, it's man-made, but it feels like a more genuine sighting. And if you want to escape the Mad-Ness completely, take the B852 around the lake's eastern shore where the scenery is just as spectacular but the tourists traps less frequent. It's so peaceful that any right thinking monster would much rather sun itself over there. Parts of this post originally appeared as part of a Lonely Planet blog. Have you seen the South Aussie version of the Loch Ness monster? It's four half-tyres artfully placed in the shallows of a swamp just outside Port Augusta. Cutely clever. 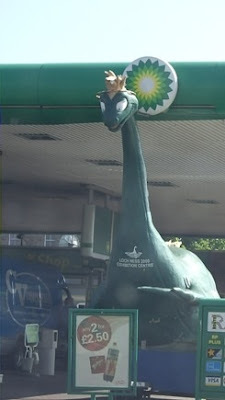 You will be pleased to know that the giant Nessie is still outside the service station near Inverness. Forgot to take a photo though, so am glad you did!